(CBS News) Mayor Michael Bloomberg has put big beverages on notice in New York City. His administration announced Wednesday a proposed ban on the sale of sodas and sugary beverages larger than 16 ounces at restaurants, delis, movie theaters, stadiums and street carts. CBS New York reports the ban will apply to bottled drinks as well as fountain sodas, and restaurants and venues that don't comply can face a $200 fine. "Obesity is a nationwide problem, and all over the United States, public health officials are wringing their hands saying, 'Oh, this is terrible,'" Bloomberg told the New York Times. "New York City is not about wringing your hands; it's about doing something," he said. "I think that's what the public wants the mayor to do." Exempt from the proposed ban are diet sodas that contain fewer than 25 calories per 8-ounce serving, fruit juices, dairy drinks and alcoholic beverages. The Times reports that restaurants, fast food chains and venues are affected because they are regulated by the city's health department, but vending machines, grocery or convenience stores and newsstands do not fall under the same regulation. 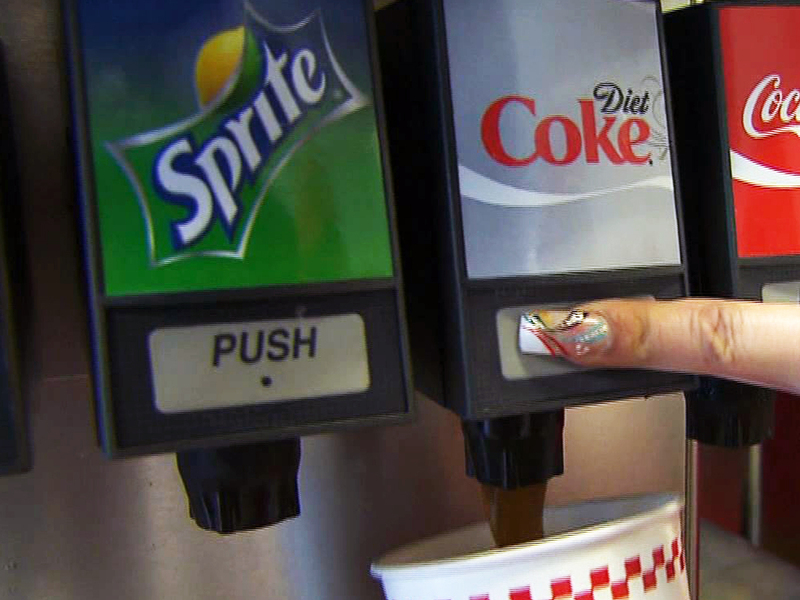 Fast-food chains would be required to hand out cups that are sized 16 ounces or less regardless of it someone purchases a diet drink, but refills would not be prohibited. According to the New York City Department of Health and Mental Hygiene, 34 percent of adult New Yorkers are overweight and 22 percent are obese. One in five New York City kindergarten students are also obese. Are New York City's health police going too far? "There they go again," Stefan Friedman, spokesperson for the New York City Beverage Association said in an emailed statement, making reference to the Bloomberg administration's previous attempts at taking on sugary drinks . "The city is not going to address the obesity issue by attacking soda because soda is not driving the obesity rates. In fact, as obesity continues to rise, CDC data shows that calories from sugar-sweetened beverages are a small and declining part of the American diet. It's time for serious health professionals to move on and seek solutions that are going to actually curb obesity. These zealous proposals just distract from the hard work that needs to be done on this front." Mayor Bloomberg previously supported a soda tax that was ultimately shot down by state lawmakers and in 2010, proposed to ban people from using food stamps to buy sugary drinks, sodas and teas. The USDA ultimately nixed that proposal in 2011, saying it would be too complicated to implement, HealthPop reported. Dr. Marion Nestle, professor of nutrition, food studies, and public health at New York University, told HealthPop that she thinks the proposal is a creative way to curb some of New York City's obesity-driven health problems. "Something needs to be done, and you can't just tell people to eat better and move more," Nestle said, emphasizing that this new proposal would simply change the default from a 20- to 30-ounce soda to one under 16 ounces. "If I'm given huge amounts of food, I'm going to eat it," she said. "Cheers for the Bloomberg administration, they're really trying to make environmental changes." New Yorkers had mixed reactions to Bloomberg's latest attempt to take on sugary drinks. "That's a good idea," Jillian Russel, a Brooklyn resident told CBS New York. "A lot of obese people are in New York." "Who are you to tell us what we should or should not do?" another New Yorker said. The proposal requires the approval of the city's Board of Health -- which is likely since all members were appointed by Bloomberg -- and could go into effect as early as March 2013. Bloomberg defended the proposal from "nanny state" critics, saying he's only limiting customer choices and they can always opt to buy more. "Your argument, I guess, could be that it's a little less convenient to have to carry two 16-ounce drinks to your seat in the movie theater rather than one 32 ounce," Bloomberg told the Times sarcastically. "I don't think you can make the case that we're taking things away." What do you think of the proposed ban?